Floral stylist Caroline Signer set this table with a spreading bouquet of roses and mums, adding fall grass fronds for a feathery accent. Eleanor Roosevelt said, "True hospitality consists of giving the best of yourself to your guests." Easy to do as the first lady of the United States, but how does that translate to a normal, daily life? Is it possible to entertain and provide true hospitality in a time when days are rushed, calendars are filled and budgets aren't graced with wiggle room? Yes! 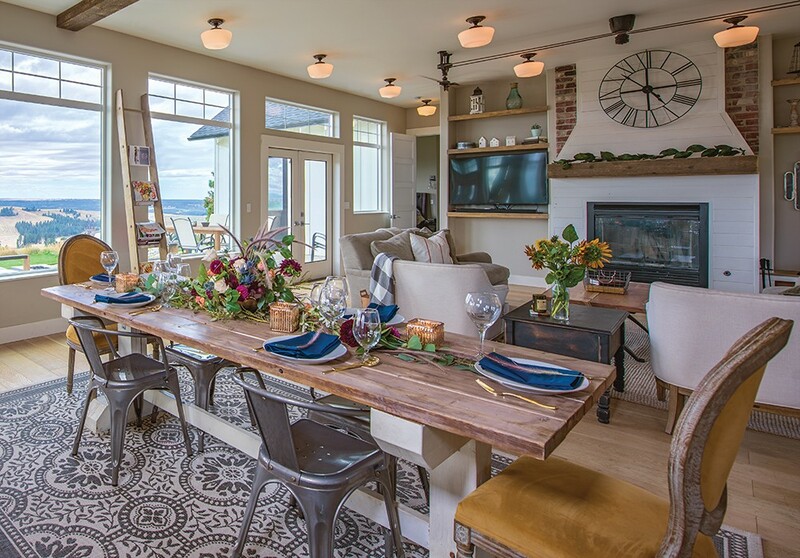 Several local experts share their tricks and tips to help you create a welcoming and hospitable experience when you entertain. 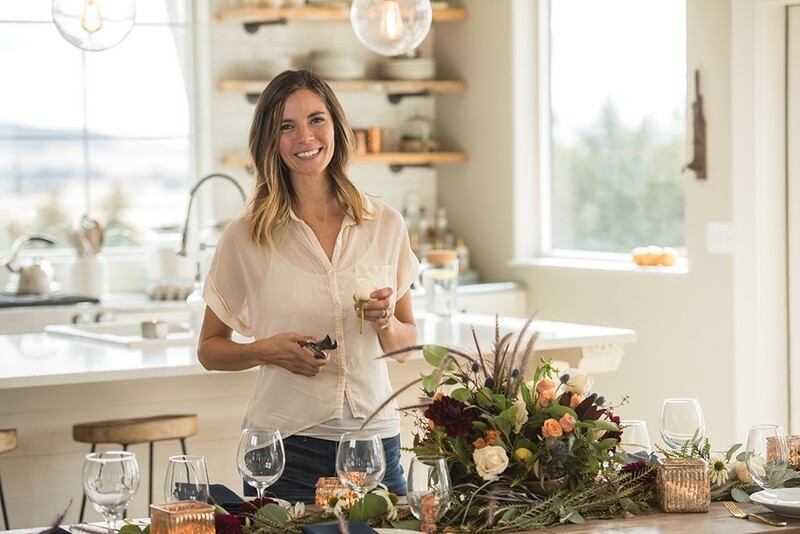 "Remember why you're doing it," says Caroline Signer, owner and designer at Caroline Signer Floral Design, in Spokane, offering one of the most important components for successful entertaining. "When you entertain, hopefully it's in some way or form to love or honor someone. Let this reason drive the event and help you stay focused and balanced on the overall picture." 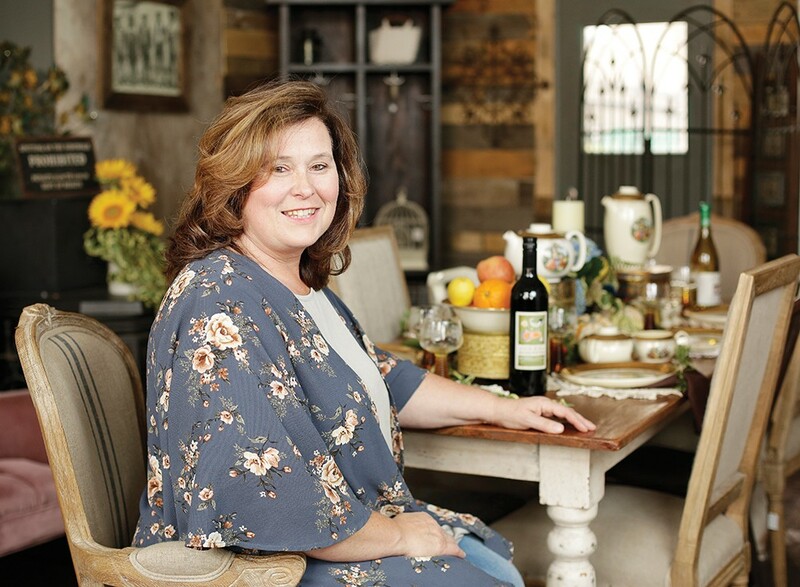 For Meghan Mollahan and her best friend Ginny Taylor, creating a special haven in their homes for entertaining is not just a passion, but a business. 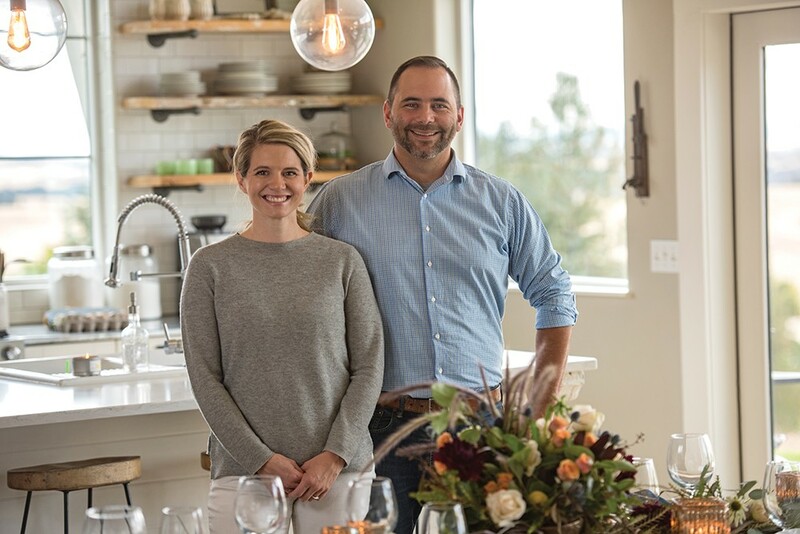 The two friends launched the Spokane-based Haven + Pine, a company that focuses on creating moments and spaces where people can feel special and seen. "Through our own experience in entertaining, we've learned that sometimes we lose sight of the reason we are hosting... to love and celebrate people in our homes," she says. They recognize the importance of not getting more caught up in all the details than in blessing the people who are gathered around your table. Signer employs basic tableware to make sure flowers get all the attention on this rustic table, which was crafted from salvaged planks by the homeowners Justin and Tarah Gray. "We believe that being a good hostess begins in your heart," says Mollahan. "Finding joy in serving others, having a warm welcome, and making it more about the people than the party makes it feel extra special." That extra special feeling brought on by entertaining is something Gerri Johnson has purposefully cultivated in her life. "My mother-in-law was the hostess of Medical Lake; her door was always open," she says, "but my upbringing was the stark opposite. So, now I want to be like her and for my guests to always feel welcome." That has become Johnson's mission both at home, as well as at Farm Salvation, her vintage boutique and community gathering spot, in Medical Lake. Being a host or hostess with a love for your guests and the desire to care for them and make them feel special is the foundation for a wonderful evening of entertainment, upon which the following building blocks can be placed. Starting with a beautiful table will provide a statement spot around which guests can gather. "Functionality first," says Signer. "I prefer florals on the table instead of food if there isn't room for both. If possible, serve the guests' plates or go buffet style, and the flowers can provide interest and beauty to the table." Mollahan and Taylor recommend decorating with a neutral place setting, tablecloth or runner; candles, fresh flowers and natural elements. "Having a centerpiece helps to anchor the table and brings a nice ambience with the glow of candlelight." 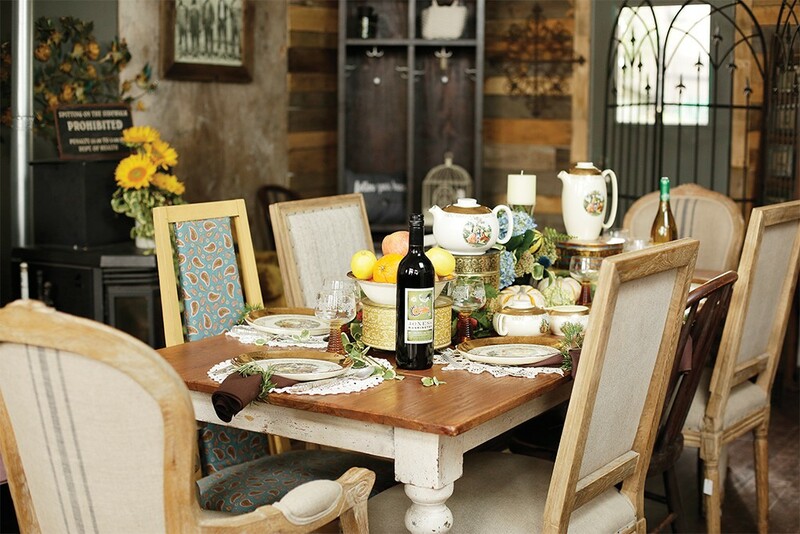 For Johnson, vintage items and family heirlooms are essential pieces in creating a warm and inviting table. Not just showcasing the pieces, but also sharing their history makes a unique experience. "Knowing is important," she says. "It is important to ask for the story behind an item." Over 40 years ago, her mother's house burned down, and she lost everything. 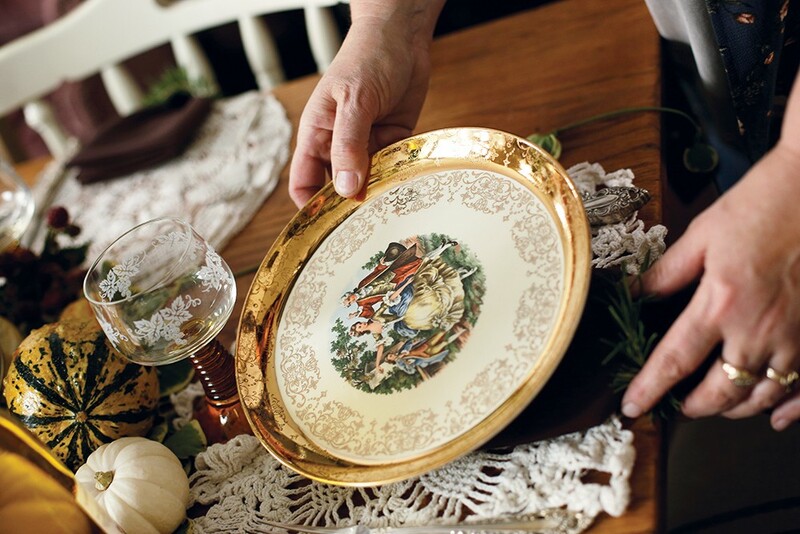 In the early 1980s, her mother found an antique store that had her lost china pattern, and she purchased the set through layaway so she could pass it on to her daughter. Today, Johnson uses pieces of this china when she entertains, bringing the story of her mother to the table. Farm Salvation's Gerri Johnson's vintage china feels fresh and friendly when combined with earthy elements — above, a fruit bowl and a scattering of gourds offer an autumn touch. "Flowers shouldn't be stressful," says Signer. "Be resourceful and creative... It's too stressful to follow a precise floral recipe found on Pinterest and run around town searching for exact flower types." Having a small, simple bouquet at the entrance to your home and at the table creates ambiance. "You want most of the blooms in the arrangement to be reaching their peak in beauty at the time of the event," says Signer. "I've even placed lilies in my bathroom and used the steam from running hot shower water to get them to open." Flowers are not the only living items that are making their way onto table tops. "I'm seeing more fruit being placed in centerpieces and garlands," says Signer. Seasonal apples or pomegranates, even tomatoes give a great abundance and earthy feel. For most people, shortages are not found in ideas, but in the pocketbook. How do you make a memorable experience without disrupting your budget? "Over my lifetime, family has been my inspiration for setting a fun, inviting atmosphere," says Johnson. "It was often on a limited budget, so I'd use things around me. I learned to utilize natural environmental decorations and seasonal design." 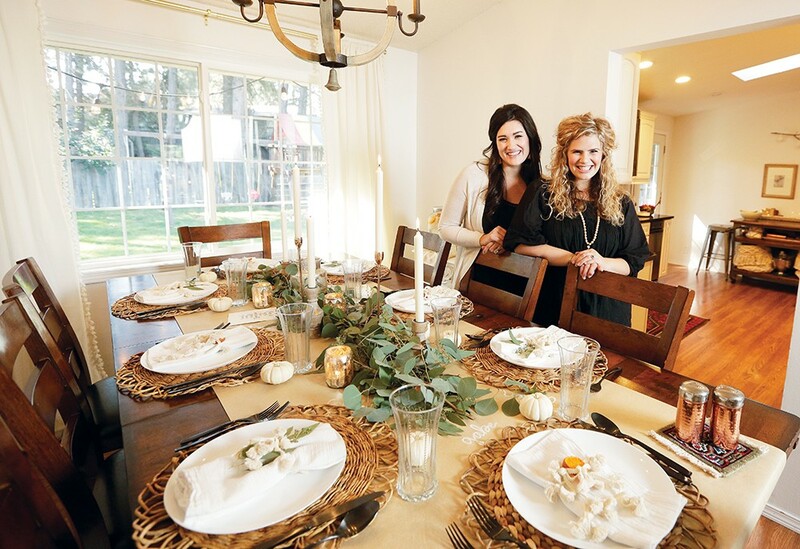 "One of our favorite budget friendly ideas is using brown kraft paper as a tablecloth," says Mollahan. "We've written 'Happy Birthday' down the center, or people's names by their place setting, or 'Merry Christmas' on the ends. It's kid friendly and makes for an easy cleanup." Natural elements from your own backyard make great accent pieces — think fresh clippings of pine at Christmas, pine cones and leaves at Thanksgiving, and flowers and greenery in the spring and summer months. Dried oranges and cranberries make things festive and add beautiful color and texture. "We suggest investing in a set of white napkins because they are timeless and you can bleach them," says Mollahan. 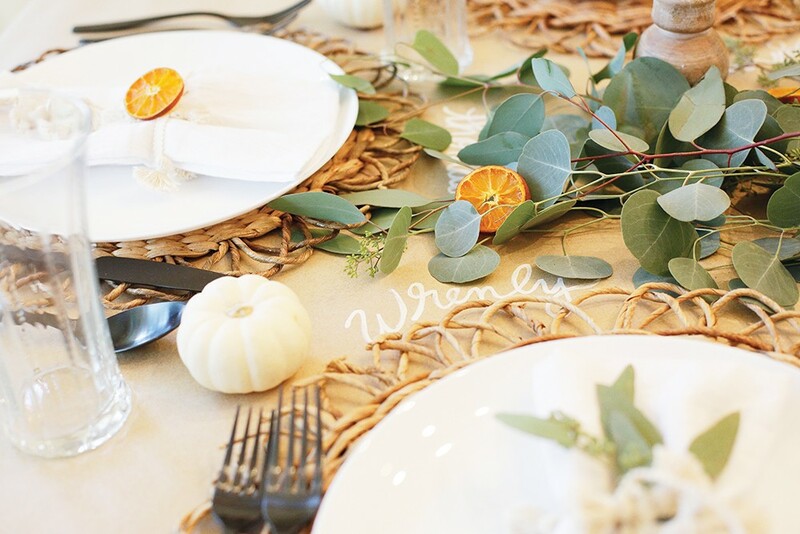 "You can tie string around the napkins, instead of napkin rings, and add a craft tag with your guest's name and tuck a leaf, piece of pine, or flower inside for a special touch." Though she is a professional floral designer, Signer is not beyond shopping her house for design pieces she already has. "Use a random bowl or forgo a container and simply lay greenery as a garland down the table," she says. "Forage your own yard before buying foliage or blooms." Making memories that are cherished is the essential goal. "One of my favorite things to do is to sit back and watch my family and friends talk around the table to each other about the deep and real things of life," says Johnson. "We have so much to be thankful for and counting your blessings every day is a real thing." 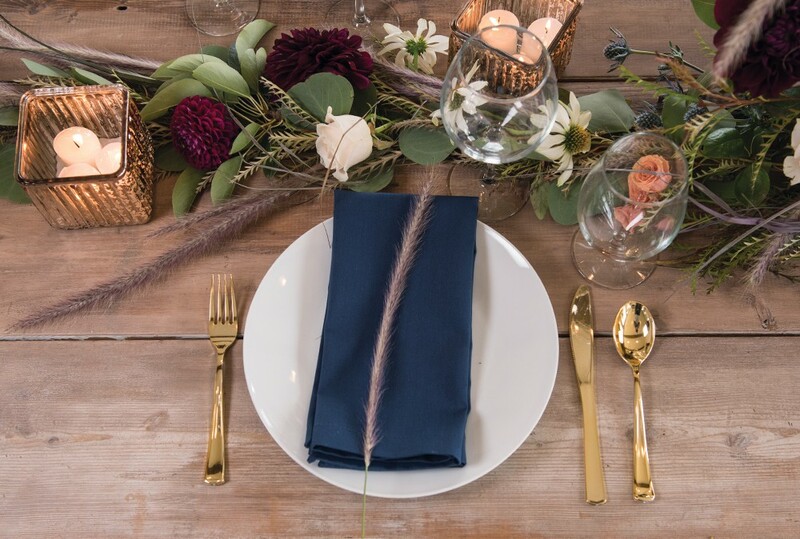 Giving the best of yourself to your guests includes counting your blessings, cultivating a feeling of love around the table and creating memories to last a lifetime. Put those together and you have true hospitality indeed. Haven + Pine's Ginny Taylor (right) and Meghan Mollahan prefer to keep center of table decor low so that guests an see each other. Think through the details about the specific person or celebration that is taking place and consider ways you can honor the guest or occasion. Set up generational photos throughout your space. They provide decor as well as a legacy and conversation starter. Deep clean the house and try to keep up the maintenance throughout the week. Spread chores, grocery lists and "to do's" out over days leading up to event, so you don't feel overwhelmed. Bake ahead and put it in the freezer. Set the table so you can focus just on the meal and entertaining. Place flowers in warm water or near ripening fruit to get them to open. Have large drink dispensers set up throughout the space for water, tea, punch, etc. Cut up some fruits or vegetables and put them in your water. Cucumbers and oranges together are inexpensive yet look beautiful and taste refreshing. 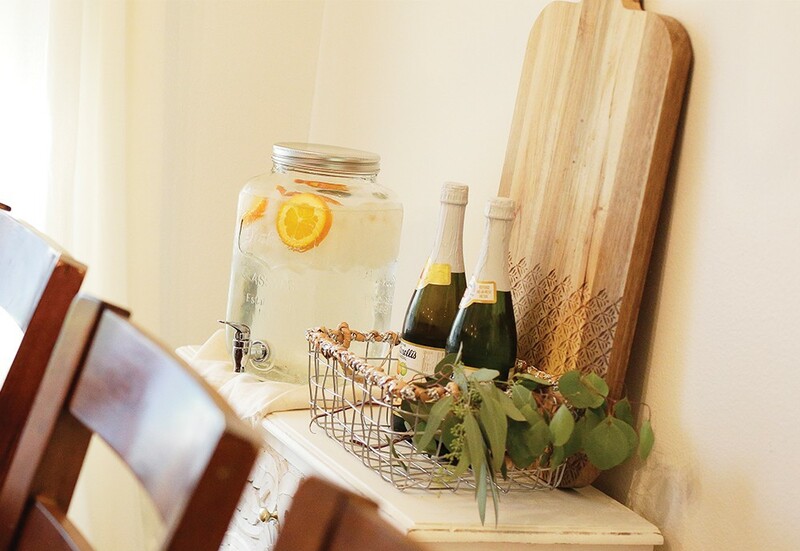 Buy clear cups and have a black sharpie tied to the dispenser so guests can write their name on the cup. Don't forget the music! It helps set the mood you want to create and helps guests relax. Intentionally seat guests where you think they will enjoy conversation and feel most welcomed. Don't be afraid of asking a friend or family member for help. We are made for community and don't need to go it alone!